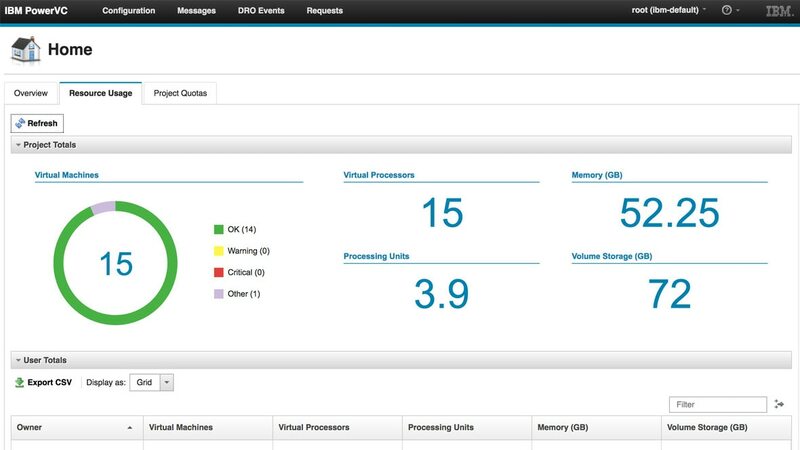 IBM® PowerVC™ is an advanced virtualization and cloud management offering. Built on OpenStack, it provides simplified virtualization management and cloud deployments for IBM AIX®, IBM i and Linux virtual machines (VMs) running on IBM Power Systems™. The offer is designed to build private cloud on the Power Systems servers and improve administrator productivity. It can further integrate with multi-cloud environments through higher-level cloud orchestrators. Simple installation and configuration saves time and IT costs with faster time to value. An intuitive user interface saves the cost of formal training and requires no specialized skills. Resource pooling and placement policies improve resource utilization, resulting in significant cost savings and less demand on IT. Host grouping provides separate policy-based control for a subset of the total managed resources. Dynamic Resource Optimizer delivers policy-based automation for active workload balancing within a host group.